The report included updates on county, Virginia Department of Transportation (VDOT), Potomac Rappahannock Transportation Commission (PRTC) and Virginia Railway Express (VRE) projects. Route 28, Phase II – The widening from Fitzwater Drive to Vint Hill Road is underway. Construction is scheduled to be completed in November 2019. 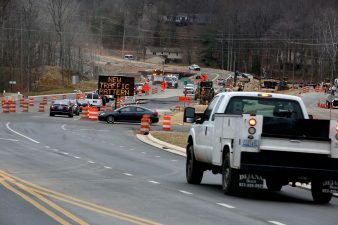 Route 28, Phase III – Construction to widen Va. 28 from Linton Hall Road to Pennsylvania Avenue to six lanes is scheduled to begin in May of 2019 with a completion date set for May 2021. Minnieville Road – Construction to widen the road to four lanes between Spriggs Road and Va. 234 is well underway. Construction is scheduled to be completed in October 2018. Old Bridge Sidewalk – Construction to add a sidewalk and bus shelter from Mohican to Antietam roads is scheduled to begin in the spring of 2018 and end in the fall of 2018. Dumfries Road Shared Use Path – The project to construct a shared-use path between Country Club and Exeter drives is under design with construction scheduled to begin in February and end in the summer of 2018. The project to build a path between Four Seasons and Talon Drives is scheduled to be completed this month. Horner Sidewalk Project – The design phase of the project to add a sidewalk between Glen Road and Kilby Elementary School will end this month. Construction is scheduled to begin in April. Opitz Boulevard Sidewalk Project – The design phase to add a sidewalk from Potomac Library to Potomac Center Boulevard is scheduled to end in January; construction is set to begin in May and end in September. Route 1-Featherstone to Mary’s Way –Utility relocation to widen U.S. 1 from Featherstone Road to Mary’s Way to six lanes will begin in April. Demolition of businesses affected by the widening is expected to begin in January. The scheduled completion date is November 2021. I-66 Park and Ride Haymarket – The project to build a 230-space parking lot at the northeast quadrant of I-66 and U.S. 15 is in the design phase with construction scheduled to be completed by spring 2019. Transform 66 – Outside the Beltway – Construction to build express lanes in each direction on I-66 from I-495 to University Boulevard with multi-modal improvements to address current and future transportation needs began earlier this month. Route 1/Route 123 Interchange – The Phase I widening of U.S. 1 from Annapolis Way to Mary’s Way is underway. Traffic should switch to the completed northbound lanes in the next few weeks. Day and night closures for placing utilities underground continue. The bridge portion for phase II of the interchange is not yet funded. PRTC Western Maintenance Facility – The project to build a storage yard and maintenance facility in the Brentsville District is in the design phase and is waiting for funding to be released from the I-66 Express Lanes project. A complete list of projects and more information is available on the county’s website.